Out of 26 tax-efficient locations around the world, Hong Kong is named best place to live for an entrepreneur* followed by London. Luxembourg is the most favourable place to live for a family** with Vienna ranked in second position. Sydney, number one location for a retired couple*** followed by Malta, Luxembourg, Limassol and Vienna. London, UK – Hong Kong, Luxembourg and Sydney are named the most favourable tax-efficient locations for the quality of life on offer according to a report by Knight Frank. The Global Lifestyle Review 2016 analyses the lifestyle available in 26 favourable tax locations around the world for people at three different stages of life. Hong Kong is named the best place to live for an entrepreneur*, Luxembourg tops the list for a family** and Sydney is the number one location for a retired couple***. Working with BDO, the leading national accountancy and business advisory firm who provided a list of 26 top locations which their clients consider when looking to move to a more tax-efficient jurisdiction, Knight Frank has examined the lifestyle factors that may motivate clients at different stages of their lives before purchasing a property. Taking into consideration a variety of factors, including but not limited to personal safety, political risk, quality of life, education, cost of healthcare and available leisure pursuits, Knight Frank has weighted these lifestyle elements and identified the top ten places to live for an entrepreneur, family and retired couple. Whilst Hong Kong, Luxembourg and Sydney top the rankings – popular tax-efficient locations such as Dubai, Geneva and London still make the top-ten list for both an entrepreneur and a family. Monaco is also amongst the top-ten winners offering excellent quality of life for entrepreneurs and retired couples. 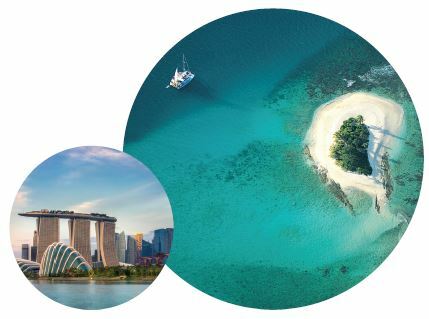 Richard Montague, tax partner, BDO says, “When choosing a destination to live, individuals often want to balance the lifestyle and economic factors, ensuring that their financial affairs and global assets are structured in an efficient manner. Objectives mainly focus on ensuring long-term asset preservation whilst complying with their global tax obligations. An understanding of the tax regime in the country of choice is key. Most countries have some form of indirect taxation, such as Value Added Tax (VAT) or property transfer taxes, and will also apply direct tax on income and profits on the disposal of assets. Other countries will seek to tax capital gifted or inherited, or apply an annual tax on net wealth. Some countries even seek to apply an exit tax when individuals break tax residence. There are many pitfalls for the unwary”. * Lifestyle factors including Mercer’s Personal Safety Ranking, distance to a major airport, number of Michelin starred restaurants, cost of a premium bottle of champagne in a 5* hotel and available leisure pursuits were considered when analysing what motivates entrepreneurs to live in a certain location. ** Lifestyle factors including the number of international schools within a 10km radius, Mercer’s Personal Safety Ranking, available leisure pursuits, cost of annual healthcare and hours of sunshine were considered when analysing what motivates families to live in a certain location. *** Lifestyle factors including the cost of annual healthcare, Mercer’s Quality of Life Ranking, hours of sunshine, cost of a cappuccino and distance to a major airport were considered when analysing what motivates a retired couple to live in a certain location. Knight Frank LLP is the leading independent global property consultancy. Headquartered in London, Knight Frank, together with Newmark Grubb Knight Frank and Douglas Elliman Fine Homes in the Americas, has more than 13,000 people operating from over 400 offices across 58 countries. The Group advises clients ranging from individual owners and buyers to major developers, investors and corporate tenants. For further information about the Firm, please visit KnightFrank.com. BDO LLP operates in 18 offices across the UK, employing 3,500 people offering tax, audit and assurance, and a range of advisory services. BDO LLP has revenues approaching £400m and is the UK member firm of the BDO International network. Our clients range from high and ultra-high net worth individuals to FTSE 100 companies and international groups. The Private Client team at BDO is experienced in looking after the tax affairs of individuals and families, entrepreneurs and business owners, family offices and partnerships, many with complex international affairs, who are seeking an adviser to help them structure their domestic and international affairs in an efficient and compliant manner.